It’s 2017 and aliens have invaded! 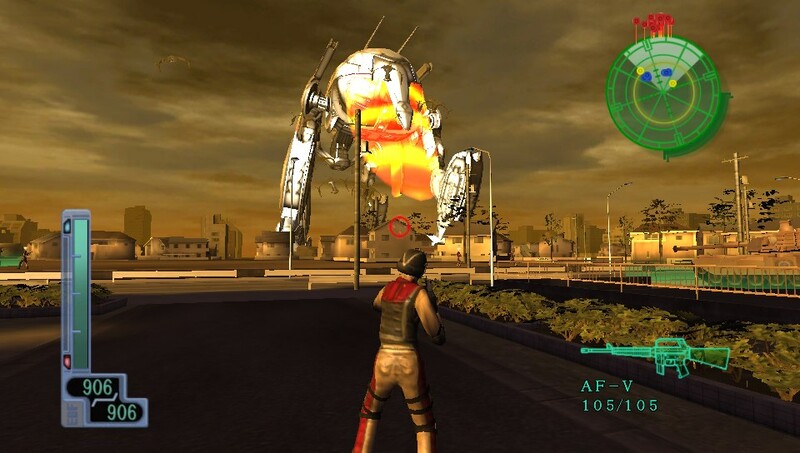 It’s up to you as a part of the Earth Defense Force to blast this alien menace back from whence they came. 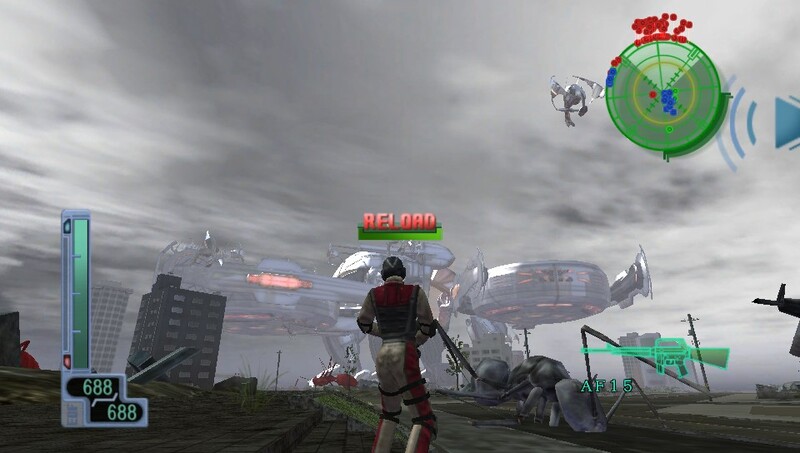 That is the basic story of Earth Defense Force 2017; you take control of a captain in Storm One, a group of soldiers tasked with defeating the alien invaders. Along the way, you’ll encounter hordes of giant bugs, robots, and spiders, and like any good soldier would do, you’ll blast away anything that moves. The graphics, although nothing spectacular, fit the game rather well. The city streets, caves, and wide open area are all faithfully represented by the game’s engine. While these may not be the most eye popping graphics ever displayed on the Sony PlayStation Vita screen, there is nothing fundamentally wrong with them either. The Alien forces although not greatly details are represented faithfully by the graphics engine, nothing is realistic looking at all but it really gives you the sense of that over the top sci-fi flick you love. The only real problems I found were a few clipping issues every now and again. Since these issues don’t lead to you getting stuck in a wall or in the ground, it doesn’t take anything away from the game play. There are also some frame rate issues that become noticeable, mainly when there are tons of things moving on the screen at one time, but again this is only a minor issue and will not effect your enjoyment of the game. The music in the game sounds as if it could have came straight out of any alien invasion flick ever made. This fits the theme of the game nicely, and will remind you of those sci-fi flicks you either love or hate. Here is a great example of one of the music tracks found in the game. I found myself wanting to say “The only good bug is a dead bug” more than once. The sound effects are nothing fancy but they get the job done. The gun fire and explosions are well presented, but they sound much better when wearing a decent pair of headphones. 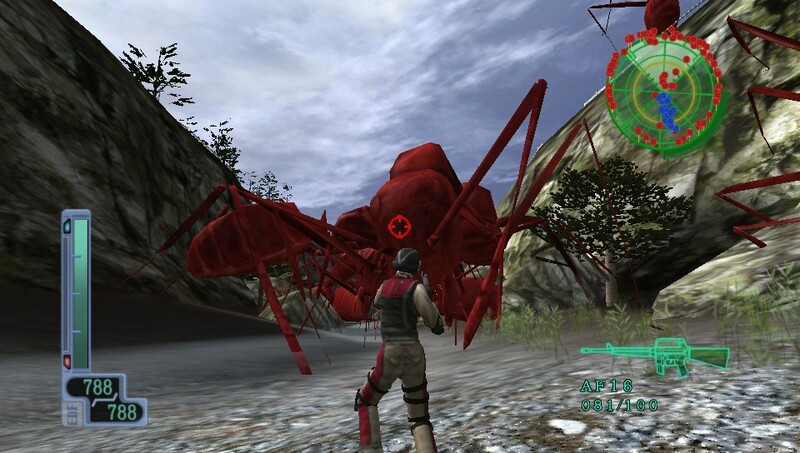 Earth Defense Force 2017 Portable plays like any standard 3rd person shooter out there. The left analog stick moves your character, while the right aims and moves the camera. The controls are excellent, very responsive, and right on the money. They are fully customizable, so you can set them up any way you would like. For example, you can move the camera with the front touch screen or the back touch pad. You can also map out the buttons any way you wish. Most gamers have a certain way they like their control schemes to be set up and they’ll appreciate this feature. I found the advanced setting to work the best for about any mission myself. The environments are destructible, so if a building is in your way, you can just blow it up. Pretty much anything can be blown to bits; you could level the entire city to rubble if you wanted to. This is helpful when those pesky bugs climb a wall and will not come down. When a mission is started, you will able to choose 2 different weapons to take with you. Also, upon completion of the game, you will have the option to choose Pale Wing as a playable character. She has a jet pack and uses energy-based weapons, so she plays a bit different than Storm One. You will unlock weapons as you progress; these will be unlocked by drops from the alien baddies you dispatch. In total there are about 400 weapons and tools to unlock. Half of them are for Storm one and the other half are for the unlockable Pale Wing. These include assault rifles, shotguns, rocket launchers, and other various weapons, so you will be playing for quite a while if you wish to see what all the game has to offer. I personally loved using a good assault rifle and handy dandy rocket launcher combo. You will need to pick and use carefully which weapons you take with you for each mission. Some missions are totally ground-based enemies, so a shotgun or rifle will do just fine for those. Other missions will have you shooting down alien aircraft, so you would likely want to take some sort of missile or rocket launcher for those missions. In addition to all the fun weapons, there are also vehicles included in certain missions, which adds some spice to blowing up the alien hordes. These include a helicopter, a tank, a bike and a powered suit. The controls with the vehicles are not done as well as the on foot controls, though, and they will take a little while to get used to. There is little variety from mission to mission, as pretty much each mission is to kill all the bad guys to move on. The game can be a bit repetitive in that regard, but I enjoyed all the different ways the game gives you to destroy its enemies. There are some multiplayer modes that will keep you playing as well. These include co-op and death match. It was pretty hard to find a room to play in, as at the time of writing this review there were not many people using the online features. Things work pretty well when you get in a match, though, with very little lag, and everything seemed to function well enough. All in all, I really enjoyed Earth Defense Force 2017 Portable. It was not the prettiest game I have ever seen nor did it have the greatest depth. It was, however, still tons of fun to blast away at the hordes of aliens with all the different weapons the game has to offer. The multiplayer was pretty solid and will help to give the game replay value. If you not a fan of repetitive games you will likely want to avoid this title. However, if you enjoy a good shooter with lots of weapons and tons of enemies to dispatch, you will want to load up you arsenal and start blasting those alien hordes as soon as possible. Title was provided by the publisher for review purposes.